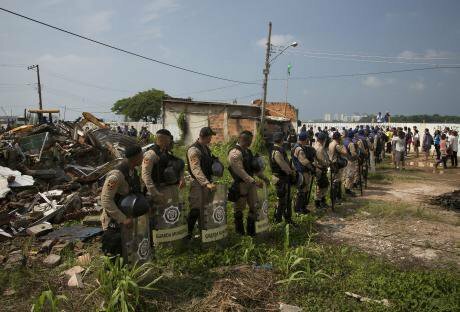 Municipal police officers stand guard during a demolition of what remains of the Vila Autodromo community in Rio de Janeiro, Brasil, March 8 2016. (AP Photo/Renata Brito). Project 100 is a special report on Olympic-related evictions in Rio de Janeiro, run by Brazil’s Agencia Publica – an independent, woman-led and non-profit investigative journalism agency committed to the facilitation of democratic debate and the promotion of human rights. The project investigates one of the untold stories of the 2016 Olympics in Rio de Janeiro: what has happened to the lives of those affected by the city’s large-scale evictions programme? Between 2009 and 2015, the Rio de Janeiro City Hall reported that 22,059 families – 77,206 individuals – had been subject to eviction. Authorities claim only one community removal, the highly publicised Vila Autódromo, was a consequence of Olympics development and a general lack of official data on Olympics-related removals provides a veil of secrecy as to the true social impact of the event. However, Project 100’s investigation has managed to pierce through the authorities’ strategy of disinformation and has not only uncovered a greater Olympic social impact than the authorities would like to admit, but also a worrying theme of ongoing housing rights violations associated with them. When all eyes were on Rio, the city’s authorities – as well as the International Olympics Committee (IOC) – were held accountable by the global media for the treatment of evictees. With backs now turned to the Greatest Show on Earth, this spotlight has moved on to the next news-worthy issue elsewhere. But Project 100 has continued its efforts, ensuring that the cameras and the Dictaphones stay on, that the voices of the victims are still heard and that the authorities’ failings are publicised. ‘Mega-events’, such as sporting competitions, Expos, beauty pageants and even the annual Board meetings of the International Monetary Fund (IMF) and World Bank, invariably lead to ‘mass evictions’. These are all in the name of ‘beautification’: a city putting on its best face for its limited time in the global media spotlight. There are situations where these evictions can be carried out lawfully, which according to the Office of the United Nations High Commissioner for Human Rights (OHCHR) are ‘only in exceptional circumstances, and in full accordance with relevant provisions of international human rights and humanitarian law’. But the International Olympics Association (IOC) is developing a worrying trend in the delivery of its great sporting event – failing to prevent widespread housing rights violations, both during the host state bidding process and in preparation for the games. Investigating the scale of these Olympics-related forced evictions in recent years, the Centre for Housing Rights and Eviction (COHRE) revealed figures as high as 720,000 at Seoul 1988, 40,000 in Atlanta 1996 and a staggering 1.5m in Beijing 2008. And while the figure for Rio de Janeiro 2016 does not seem so dramatic next to some of those figures, after promising the city ‘sustainable social and urban transformation’, it seems the IOC has missed an opportunity to get things right again. It should be noted that in many cases, removals are carried out in line with international standards and individuals do see a long-term benefit – many of the relocations have brought better sanitation, access to services and safety. This being said, the widely reported damage to both communities and individual lives highlighted by Project 100 - as a direct consequence Rio’s preparation for mega-events – is unacceptable, especially when these are events that promise positive social transformation. Project 100 found that during the eviction process, cases of violent evictions, psychological bullying and the intentional degradation of living conditions were common. This was coupled with serious mismanagement of relocations, with the authorities divisively distributing uneven compensation packages and leaving families in massive debt to banks. Perhaps most shocking is the dominance of organised crime throughout Minha Casa, Minha Vida, the government’s social housing scheme. It was reported in 2015 that all 64 of Minha Casa, Minha Via housing estates had been targeted by organised crime, but more worryingly that 38 were already in the control of militias – including several that were receiving Olympic evictees. Whether it is due to over-ambition on the host state’s part, or IOC naivety, the setting of unrealistic expectations for Olympic-related development is irresponsible. It puts intense pressure on the existing cracks in society, of which in Brasil – with its ongoing political, economic and social crises – there are many. A host-state’s unstable context does not spare the IOC and its associated bodies from their responsibility to ensure that those states bidding for the Olympics are capable of hosting without resorting to such poorly managed urban interventions. In fact, it suggest they’re not learning from their mistakes. Project 100 only need 35 more stories to complete this ambitious piece of multi-media investigative journalism and will rely on further public support to complete the project. On the website, you can find video, audio and opinion, documenting the individual cases of the victims of Rio’s housing rights violations. In Botafogo, Rio de Janeiro, Casa Publica is the cultural centre behind the project, and continues its work through the exhibition of related photography, art and installations. Jenifer Lessa dos Reis is 16, and was moved from an occupied building in rio’s city centre to government housing in Senador Camara. The state of her housing has improved, as her former home was in an unsanitary state next to a rubbish dump and had leaks. But where she has been moved to now is dangerous. “you can’t stay out when there are shootouts – because of the risk of stray bullets. It wasn’t like that where we were, you could go out, cross the street, play. My daughter, who will be a year old soon, can’t go out there. It’s very rare that I leave the house,” she said. Jailson Lourenço da Costa Nascimento now shares a two-bedroom tenement apartment with his wife and eight children, after being evicted from an occupation in the port zone, regenerated as one of the Rio 2016 legacy works. Although his family were told they would be rehoused under the government housing scheme Minha Casa, Minha Vida, when they were evicted seven years ago, that never happened, and he was left to fend for himself. Many of his former neighbours suffered a worse fate than Jailson. “I see my former neighbors in total degeneracy. Crazy, living on the streets. Many of them already died, tuberculosis,” he said. Ozineide da Silva was one of many who got moved to government housing, when she was moved from a disused warehouse in Ipadu in Curicica to Colonia in 2014, but later received a bill from the bank asking for her to pay the rest of the cost of the new apartment. Although she says City Hall promised to pay the rent, they had not been doing so. Ozineide has been left with a bad credit rating as a result of the debt. She was given no paperwork to prove she has a right to live in the house. “I don’t have anything here which says this is mine,” she said. A model of digital activism for the future. Project 100 has already achieved two important objectives. Firstly, in a world where we are typically impressed by big numbers, it has shown that attention to detail and quality are just as important. Reporting on just 100 individual stories, the real impact of the Olympics on Brasil’s fragile society is just as alarming as the abhorrent scale of forced evictions at previous events. Secondly, as digital media lead to more transient activism, this project has committed to its cause despite the media spotlight having left the city of Rio de Janeiro. It has continued to investigate and uncover stories that have already become yesterday’s news for the global media platforms. For both these reasons, Project 100 is a necessary and worthy piece of investigative journalism, and without it the hypocrisy of the ‘Olympic legacy’ will likely be forgotten for another 4 years – that is, until the same mistakes have been made again.